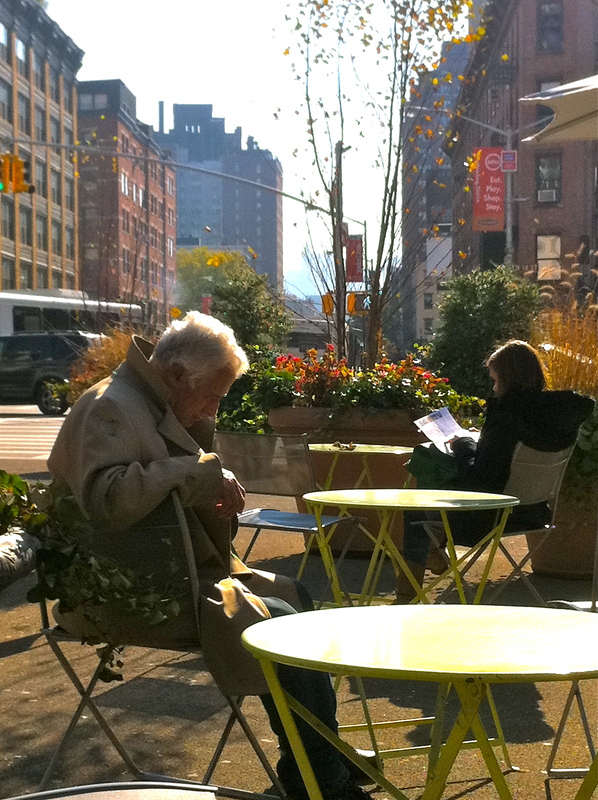 The bliss of restful waiting in the early afternoon sunshine down on West 14th St, NYC. Andrea, the sun was so warm and pleasant I found it difficult to stay awake, plus it is one of those strangely relaxing parts of the city – a traffic island at the end of 8th Ave. Who would have thought it possible! Hello Nandini and thank you for your comment! I think an afternoon siesta is so civilised, don’t you? Thanks Jake! Waiting can be a relaxing past-time! It looks like the guy is going to sleep. My husband goes to sleep when he sits down to watch TV. Hey Connie! He was indeed asleep and I was so envious! At least your husband is getting something decent from watching TV – I can cope with the sleeping / TV watching unless there is a snoring soundtrack to go with it . . .
. . . and whenever you come to NYC you know just where to go for some relaxing sunshine. We take it where we get it! I like this photo because it seems as life is so busy around the two individuals and they are able to wait, perhaps for a moment, to slow it down. Hello Sunshine, what a lovely name you have! In your comment you have managed to sum up NYC in the nutshell that it is, thank you! Your photo is wonderful, the colours, the whole scene tell such a story of waiting. Well done. Lovely to think we have the ability to “switch off” in the midst of all that activity and soak up the sunshine. Thank you so much Maggie for being a part of it! Wonderful photo! I used to live and work in that general area and I’m pretty sure I walked my dog past this spot many many times. Brings back nice memories! Did you ever walk around other parts of the city and think how much fun it would be to live “here?” It happens to me so often. I do hope you are enjoying making new memories in Utrecht as much as I enjoy your lovely postcards! Hello Frizztext, I remain enthralled by your wonderful solitude post . . .
Hello Frizz. It was one of those crisp cool NY days but blessed with blue sky and sunshine. The gentleman was enjoying an afternoon snooze, the girl was reading something and behind me others were drinking coffee etc. I was there on my own, enjoying the sunshine quite forgetting that the space is a traffic island in the middle of a busy NY avenue! Somehow, we were all there together, enjoying our moment of solitude. We get it where we can! and thank you Amar for visiting. Love your take on this week’s challenge! That’s so cute 🙂 well captured! Thank you! The sunshine of the moment was captivating, and so relaxing! Cheryl, thank you so much for the ping back! My first take was the same as Andrea’s. I felt sorry for this man, he seemed lonely. Even after you say that he was asleep (he didn’t look it at first glance) — he still seems very alone. I guess body language can be as ambiguous as any other kind. I do understand your feeling. I suppose I saw my father-in-law in that seat. He was perfectly at ease with himself, wonderful company and idiosyncratic enough to make the most of a cat nap in the brilliant sunshine. We were all of us there on our own enjoying the warmth of the moment together! Really cool pic. I like the composition – to the buildings in the background and the vegetation in the middle to the waiting people in the foreground. Thank you UBG. Not at all bad for a traffic island in the middle of a busy avenue. So pleased you enjoyed!
. . . sunshine dreams worth keeping! Great composition; you fit so much into that frame; you have some amazing photos on your site such a great story with so many great shots. Such a very kind and appreciated comment, thank you so much! It was such a lovely, lazy afternoon, thanks Jo. Always lovely to see you here and to see your great shots! You captured a story, thanks so much, Patti. is he waiting for his beloved? Hello Venusa and thank you so much for your comment. Perhaps he was waiting for his beloved but, judging from the variation in comments, he is whoever, doing whatever, you think him to be! Looks like a nice day to wait around 🙂 Nice shot. One of the best & meaningful photographs i have ever seen. Great job. You captured the theame waiting so beautifully. Great job!! Arindam, thank you so much for this very generous comment. I really am overwhelmed! Absolutely perfect time for siesta, thank you Gracie! Great photo. My husband can nod off like that – while sitting up. A very valuable skill! One of life’s true skills – I can’t do it for fear of falling over! Thank you Tess, it was one of those afternoons which took care of itself! I should have known, perhaps next time. Love the implied status on both counts, thanks Pete!